Venigross Gloves Factory is located in Rathupaswela (about 17 km from Colombo). The factory caused water contamination, affecting twelve villages. People demand clean drinking water. Venigross Gloves Factory is located in Rathupaswela (about 17 km from Colombo). The factory has caused water contamination in a more than 3 km radius, affecting twelve villages. People affected by the factory demand clean drinking water. Their well water in fact has become acidic and people believe that it was due to the release of acidic effluent. On August 1st 2013 local residents held a demonstration and the government deployed military and killed 3 people, including a 17 year old school boy, Akila Dinesh, and many others got wounded. A Buddhist monk was also involved in the leadership of the mobilizations. This information has been provided by the Centre for Environmental Justice of Sril Lanka (http://www.ejustice.lk/) and a resident of the area seeking the removal of the factory. 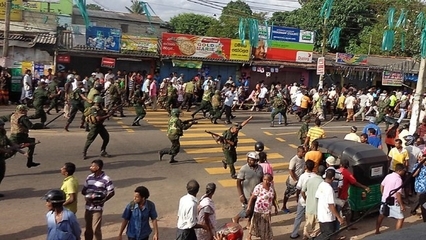 In a related incident strongly reminiscent of Rathupaswela, hundreds of people protested on March 15 and 16, 2014, demanding the closure of the Hanwella Rubber Products Factory (Sunday Times). A monk had informed the population that waste water from this rubber glove factory was contaminating the water. The monk informed them that pH levels in the groundwater were low and that it was not suitable for drinking. “He asked me to lead the residents near my house and to test the water in our wells for contamination,” a resident said. “Several of us did this and it was revealed that the pH levels were indeed low.” A large number of agitated families then stopped drinking from their wells. Some have to walk for miles to fetch ‘fresh’ water. Why? Explain briefly. Nothing has been done, yet, it appears, to solve ground water pollution. There have been demonstrations and legal appeals (2014). Press release from Centre for Environmental Justice (Sri Lanka), CEJ and “Siyane Jalaya Syurakeeme Jana Neguma"